For over 20 years, Paul Jurkowski has been a devoted and committed member of Control Point Associates, Inc. and has been instrumental in creating the solid core foundation of excellence that has established Control Point as a leader in the Professional Land Surveying industry. Paul’s experience, knowledge and superior attention to quality standards are all key factors in the continued growth and expansion of Control point Associates, Inc. throughout the region. Paul has provided his professional experience on various projects such as The Highline, Manhattan NY, Brooklyn Navy Yard, Brooklyn, NY, New York Jets Parcel, Florham Park, NJ, Coney Island Improvement Project, Coney Island, NY and Golden Nugget Casino, Atlantic City, NJ. 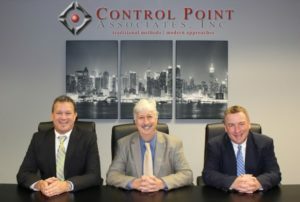 Jim Weed joined Control Point Associates, Inc. over 7 years ago and is licensed in five states. Jim brings not only extraordinary professional experience, but also has been key in helping to define the path that has led Control Point Associates, Inc. into new markets and the growth within our existing corporate structure. Jim also pioneered the path for a variety of geospatial surveying services, defining him as one of the leading professional experts in this field. Jim has led his team on various projects such as Columbia University, Manhattan, NY, White Plains Hospital, White Plains, NY, Glenwood Power Station, North Hempstead, NY, St. Augustine Roman Catholic Church, Brooklyn, NY and Castillo San Felipe Del Morro, San Juan, Puerto Rico. Both Paul and Jim provide outstanding leadership and are focused on the continued evolution and growth of Control Point Associates, Inc.
Control Point Associates, Inc. welcomes another strategic hire, Ken Stigner as Vice President of Business Development and Operations with over 40 years of professional land surveying experience in a highly diverse market sector. Ken has personally developed technical advances within our industry over the years and is committed to the continued outstanding quality services Control Point has delivered since inception. Ken’s focus will be on the development of future technical services, cultivating key staff resources and the future growth of Control Point Associates, Inc. into new and existing markets. Ken joins the senior leadership team and will be responsible to propagate continued expansion. Ken’s experience ranges from topographic and site surveys for the development of various industries and is the surveyor of record for many well-known properties such as: The World Trade Center Complex, which included transfers of interests between numerous agencies for property interests for the new tower, the memorial and other buildings, boundary surveys for both the new and old Yankee Stadiums, the new Brooklyn Area, John F. Kennedy Airport and LaGuardia Airport. Control Point Associates, Inc. is always actively looking to acquire the top skilled professionals and the talent necessary to continue to provide the industry and its clients with innovative solutions and successful projects. To apply, please submit your cover letter and resume to resumes@cpasurvey.com and someone from our human resources department will be in touch with you.